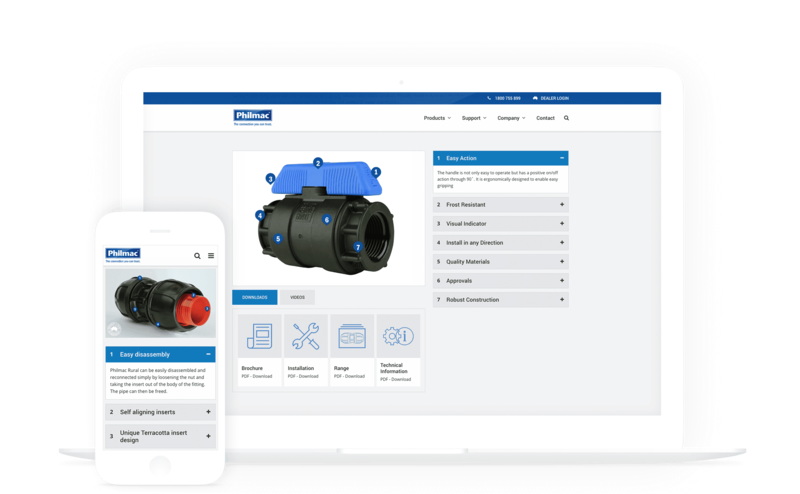 Redeveloped website for the global leader in the design and manufacture of specialist fittings and valves. Philmac required a new and responsive website designed to support the primary function of product information sourcing. The website was desired to appear clean and modern and keep in line with current branding. The large listing of products needed to be categorised systematically. This was achieved by sorting products into categories and subcategories depending on their type. Consistent correspondence between The Digital Embassy and Philmac was required to ensure that all products were accounted for and sorted in an appropriate, logical manner. Product descriptions and specifications were written to provide relevant information to users and improve the SEO of the website. This additional content increased the scale and complexity of the project and required extensive communication between parties. The Digital Embassy approached the project by prioritising accessibility of products and including visual references to current branding throughout the website. Existing branding elements included the Philmac logo and ambassador Bluey dog. Improvement of UX design within the search bar was a key element of the project, designed to enhance product information accessibility. The search bar feature was designed to include pictures of results and the option to access more information. 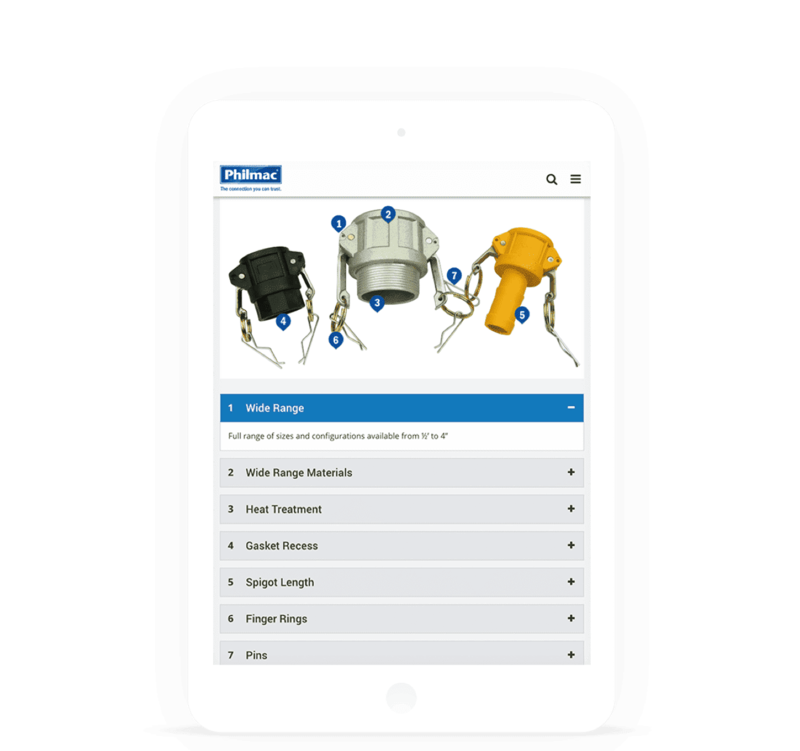 Users are now able to use the search function to access pictures and videos of products as well as downloadable PDF files. The extensive volume of content that was required to be created and sorted called for flexible project management due to the changing nature of requested content and product specifications. In order to maximise efficiency of the website development The Digital Embassy adopted a flexible approach by moving between developmental stages rather than progressing through stages systematically. As a result of this flexible approach, stages of development routinely reliant on content completion were able to be advanced in order to meet deadlines. The Philmac website was built with our own custom CMS, Consul™ specifically designed for business enterprise deployments. The platform utilises WordPress, providing Philmac with all the benefits of its acclaimed user centric features such as its ease-of-use content management including simple and flexible editing and customisation. In addition to these, Consul™ provides a new robust system architecture to WordPress that can be customised and scaled to deliver functionality, style and enhanced user experience for advanced business application purposes. The improved website interface, user-friendly structure and SEO techniques have resulted in tens of thousands of new users visiting the Philmac website since its launch in February. Now mobile responsive, Philmac is able to reach a larger consumer base and facilitates higher levels of engagement. The website is now easier for potential customers to find through organic search as a result of employing SEO techniques. Additionally the overall increase in usability has lengthened the time that users remain on the website, due to the improved user experience when searching for information. This exceptional result for Philmac and The Digital Embassy is a testament to the successful planning and implementation of the project.